Hollywood, February 16, 2011 – Guillermo Del Toro and The Jim Henson Company have joined forces with Pathe to develop and produce a 3D stop motion animated version of PINOCCHIO based on the edition of Carlo Collodi’s classic tale illustrated by Gris Grimly. Grimly will codirect with Mark Gustafson (Animation Director on THE FANTASTIC MR. FOX). The team plans to move forward with production of the film later in 2011. In this new version of one of the world’s best-loved tales, the puppet Pinocchio embarks on a series of extraordinary and thrilling adventures, proving himself to be as indestructible as his love for his father. Del Toro and his frequent collaborator Matthew Robbins have been developing the screen story over the past year, and Robbins wrote the screenplay. Del Toro will produce with Lisa Henson and Jason Lust of The Jim Henson Company and Allison Abbate (THE FANTASTIC MR. FOX, TIM BURTON’S CORPSE BRIDE, FRANKENWEENIE). Gary Ungar will serve as executive producer, as will Francois Ivernel and Cameron McCracken for Pathe. Veteran rock musician and film composer Nick Cave will serve as music consultant for the production. BURTON’S CORPSE BRIDE and FRANKENWEENIE. 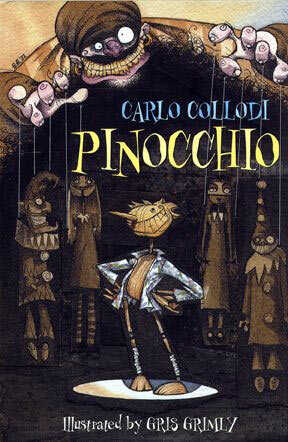 "I believe that our tale of PINOCCHIO recaptures the darker, more daunting aspects of the book that have been missing from previous film incarnations and takes advantage of all the allegorical aspects of the tale. Gris and Mark have a clear vision of this world. Matthew, the directors and I have constructed an adaptation that I feel enormously proud of,” said Guillermo Del Toro. “Stop motion animation will be a new style of telling this well-known tale, a hand-crafted style with which we were eager to work since it requires a high level of artistry and craftsmanship that is similar to the work of The Jim Henson Company,” said Lisa Henson, CEO of The Jim Henson Company. “There is a perfect match between the visionary world of Guillermo, the story of Pinocchio and Gris’ wonderful illustrations. The talent and experience of the Henson team will ensure that Gris, Mark and Guillermo’s vision comes to life in the most thrilling way,” said Francois Ivernel, Executive Vice-President, Pathe.